Patek Philippe is adding a sparkling model fitted with a mechanical movement to his Twenty-4 Haute Joaillerie collection. 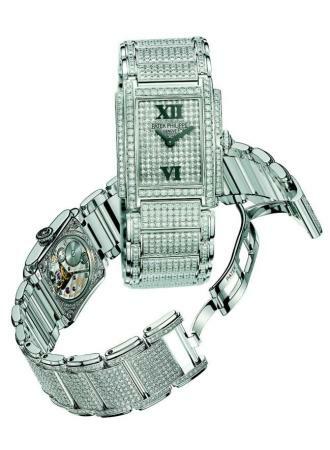 This Twenty-4 Small is set all over with 1,468 Top Wesselton Pure diamonds (8.33 cts). The back of the case, set with 104 diamonds and fitted with a sapphire crystal, makes it possible to admire the movement stamped with the famous Geneva Hallmark. Movement is a Patek caliber 16-250, hand-wound with 38 hour power reserve. The case is in 18kt white or pink gold, set with diamonds. The crown is set with a brilliant. Sapphire crystals front and back compliment it. The dial is set with diamonds, Baton hands and appliqué Roman numerals in black oxidized gold.